Photography can be an expensive hobby these days! Whilst it is perfectly possible to shoot small jpegs and to print them at a booth in your local store, most serious photographers are shooting RAW images in large numbers, and using Photoshop CC 2015 and Lightroom (or similar) to edit them. If you do any video work, or perhaps need to do some print work with InDesign, suddenly you need acres of storage space and a high-end workstation to make the process flow. 5-years ago, in another Christmas project, I built my first decent PC using an SSD for the operating system and the, then current generation of, Intel i7 chip. This has served me very well, even to the point of adopting Windows 10, but the final nail in the coffin was the recent update to Creative Cloud 2015. These days I use plugins extensively (On1 and the Google Nik Collection) but the combination was only useable with extreme patience! So time for an upgrade. Time for me to set about building a new PC. Lots of things change over a five year period, in life as in PC tech. My partner in crime Geoff keeps in touch with the hardware developments and is an avid subscriber to Micro Mart Magazine. He put together an initial specification, as the basis for discussion, and together we researched further and finessed our individual computer builds. I’ve been using a Dell monitor for the last 8 years, and it’s been great, but I also took the opportunity to upgrade to a slightly larger 27 inch model with 100% Adobe RGB (and sRGB) colour (Dell UltraSharp Premier Colour UP2716D) on the grounds that it would be better for my eyesight as well as my colour correction. Apparently the colour profile is fabulous straight out of the box. We’ll see and I will comment further once I’ve a few hundred more hours photo-editing under my belt. The order was fulfilled promptly by Amazon, Scan and Ebuyer without fuss, though the packaging on the Dell monitor was water damaged on arrival, but the contents were dry and untouched. Close to Christmas, it did not seem worth taking the risk of sending it back and risking not being able to complete my build during the holidays, so I kept it. It’s a little beyond the scope of this article to describe the full detail of my build, but I will share some of the highlights. Firstly make a big pile of boxes and admire. 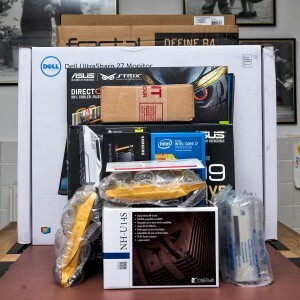 Next unwrap the goodies and make sure you have everything you need for your build, and that you have looked at the Motherboard manual to know where the different connections are for the Power supply, Fan headers, SATA and SATA Express ports etc. Make sure you also know which memory slots to use if you aren’t using all of them, and finally make sure you understand any restrictions on the PCIe slots for peripherals. The next thing to do is to think really hard about the order in which you want to do things in order to make it easy for yourself. For instance, it’s easier to fit the processor to the motherboard before you fit the motherboard into the case. Also, when you’re building a new PC, it is easier to fit some of the cables to the motherboard before you fit it inside the case. Which cables to fit depends on your specific board configuration and also your particular case. The Fractal Define R4 is an excellent case. It’s very well made and quite a bit wider than the Cooler Master I used for my previous build (I could hardly fit the GTX 970 in that case) so there is more breathing room than in some boxes. Nevertheless space will be tight in some scenarios, and you don’t want to be forcing cables onto headers as this will stress the motherboard and lead to breakages. It was fun to photograph the various parts as a memento of the build. The Intel i7 5930 Processor was gorgeous to behold, and the Asus X99 Deluxe u3.1 Motherboard looks so stylish that it begs to be lit and viewed through a transparent case (not that I’m keen on that sort of ostentatiousness usually, but you can see why people do that stuff). Here is the case with the sides removed. Apologies for the industrial strength vignette, it does focus you on the case though. The R4 has some lovely detailing with it’s white fans and drive bays etc. It comes with a box full of screws and a manual leading to an easier build experience. Another benefit of the R4 is that you can fit extra fans in the top (2 fans) and side (1 fan) should you need them for extra cooling. It’s vital to ensure a stable cooling environment if you are minded to overclock your system. The speed of a processor depends on how many things it can do linearly per second (Clock Speed), and how many things it can do in parallel (Cores and Threads). The overall speed of the processor also depends upon the speed at which it can write out to, and retrieve from, it’s supporting memory systems so the RAM bus speed is also crucial. So what is clock speed (and thus overclocking)? Clock speed, or rate, is usually given as a frequency in gigahertz (GHz) these days and it’s the number of times a second that a processing step occurs. Some programming operations can take more than one step so there isn’t necessarily a one to one relationship between the clock frequency and the execution of lines of computer code. As far as graphics processing is concerned though, the faster the better, and the more parallelism the better (at least in graphics cards and some video editing software). Asus are manufacturing a range of motherboards with the so called X99 Architecture. So what does this mean? 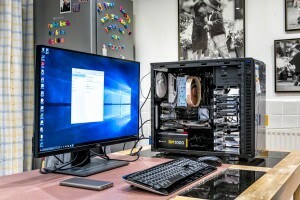 The new intel Core i7 processor and intel X99 chipset were designed to provide the ultimate desktop PC platform for extreme gamers, enthusiasts and content creators. It has special features which enable it to be overclocked and give great performance for gaming and digital content creation. This includes 6 and 8 core processors on the, so called, LGA2011-v3 socket (that’s an LGA2011 without a processor fitted on the left). Performance is boosted via Intel’s Turbo Boost 2.0 technology and Intel Hyper-Threading technology. As well as ultimate performance, the X99 architecture also maximises input/output and storage capabilities. 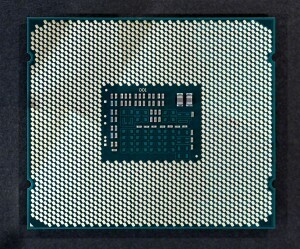 The Intel i7 5930 processor used here (6 Cores), for instance, and it’s big brother the i7 5960 (8 Cores) have 40 PCIe (PCI Express) Gen 3 lanes, 10 SATA ports (for your disk drives), 14 USB ports (a key factor for me) and 20 MB of Smart Cache. Intel Rapid Storage technology delivers excellent storage performance and features to improve system responsiveness. The new Core i7 processor with the Intel X99 chipset also gives us quad-channel DDR4 memory at 2133 MHz that can support up to 4 unbuffered dual inline memory modules per memory channel with a max DRAM density of 4 GB and 8 GB. So this board can have up to 64 GB of memory in total! With up to 40 lanes of PCI Express 3.0 the X99 platform gives you the flexibility to plug in up to 4 discrete graphics cards to provide dramatically reduced editing time for RAW photos and HD video. Given that I have a spare GTX 970 now, I may add that into my build once I’m happy that everything is running in a stable setup. This means that the user can performance tune the processor and memory frequencies themselves, without having to run any other part of the system above specifications (and hence risking, for instance, heat damage from large voltages). The X99 chipset has integrated USB 3.0 support and the Rapid Storage technology allows the full Serial ATA (SATA) interface to go up to speeds of 10 Gb/s in keeping with the next generation of fast solid state drives. There is also a Rapid Recover technology that helps users to recover their data and return their system to an operational state and a Dynamic Storage Accelerator which speeds up the performance of your SSDs by dynamically adjusting the system power management to give up to 15% performance boost. All the I/O You Will Ever Need..
What on earth was I thinking when I specified Wi-Fi for a Desktop Computer that would never leave my office next to the superfast broadband router cable? Actually it was just an indulgence in the long term, but very necessary at the point I was doing the build. My office is far too small to build a new computer in and I couldn’t afford, at the point I did this build, to be without a computer. Wi-Fi lets you connect to the internet and get on with your install, until such time that you have a stable setup. I have known network cables to fail sometimes, usually when you haven’t got a spare one to hand and the shops are shut! If that ever happens, I’ll have a very useable setup using wireless. The Connected Side of an i7 5930.. I haven’t tried to count the number of pins in an LGA2011-v3 socket, or the number of gold plated connectors on the back of the i7 5930, but there look to be, quite literally, hundreds. In fact, apparently, the clue is in the name, there are 2,011 contact pins in the socket. The Asus X99 Boards have extra pins to help them manage the overclocking functions, which, I suppose, must mean that there are more contact patches on the i7 Haswell-E Processors than there are in the standard v3 socket. Ok, I admit it, my curiosity has been piqued. How many contact patches are there on my i7 5930? I did count them in the end after all. There were 2,092 including the 8 patches in the inner square, and excluding the triangular patch that tells you which way round the processor sits in the socket. How did I count them? I used Photoshop’s count feature (once I’d located the count tool which is not shown by default in CC 2015, presumably because hardly anyone uses this very useful feature much these days). To insert the processor you lift up the two retaining springs which allow the hinged cowling to swing up. You remove the plastic pin cover and then place the processor with the triangular marker aligned with the mark in the socket. Next you replace the cowl and the springs (which do require quite a strong force to replace). Next simply admire to taste. The top of the processor looks just as cool as the contact face after all. You won’t get to see this again (hopefully) because soon we are going to have to install the heat-sink, which first requires you to place a dollop of thermal paste on top of the processor so that you don’t get a metal to metal contact with the heat-sink. Things have moved on since my last build, the heat-sink is no longer a small fan assembly atop the processor, but now a massive radiator with a fan the size of the extractor unit in my en-suite bathroom. No-seriously, it’s pretty much that large!! Or a water cooler of course. I used the Noctua NH-Ul4S Slim U-Series Single Tower CPU Cooler. When building a new PC, to fit the motherboard, you first screw in the mounting posts to the relevant pre-threaded holes in the casing assembly. Next, as mentioned above, you may wish to fit a few of the necessary cables to the more difficult to reach motherboard headers and SATA cable sockets. SATA and SATA Express Sockets..
Then you drop the motherboard into the case and fix carefully by screwing through the motherboard into the mounting posts that you previously secured. These fixings also serve to earth the board to the cabinet in several places. Next comes the power supply. In this case a Corsair RM 1000W fully modular 80+ gold power supply. It’s worth investing in a high quality power supply because of the extra stability of the voltage supplied, and a decent wattage, particularly if you plan to have more than one graphic card, or to expand to the max. Generally the fan faces into the casing when fitted and vents waste heat out of the back of the unit. 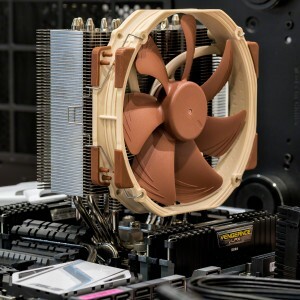 Noctua are recognized as making the best fans, and many people swap out their case fans for Noctua ones. They are very quiet and provide a constant pressure. The radiator towers can be single or double thickness with one or two fans (push, versus push-pull). I have it on good authority that for the thin tower version adding a second fan makes very little difference to the CPU temperature (Linus Tech Tips). I’m using the Noctua NH-Ul4S Slim U-Series Single Tower CPU Cooler here, and even this seems massive compared with previous fans I have used. I’d be grateful for an extra fan this size in my en-suite bathroom! This fan gets great reviews for running silent, and for it’s cooling power, so it is ideal for a machine that will be overclocked. It may be that a water-cooler would be better still, but that seemed overkill for this application. Somehow it seems a bit risky to place a water system into a box of electrical components? I’m sure they must be durable and safe though. The other advantage of this single-tower fan is that it allows easy access to the memory modules which can be easily fitted and removed without having to move the cooling assembly. The fan itself is held in place with easy to remove clips to further improve access. 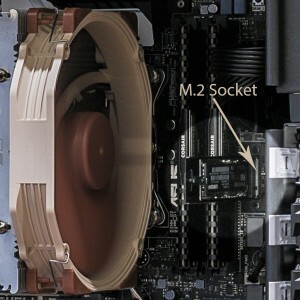 Of course there is another benefit to having a second fan on your cooler tower, which is to provide built in redundancy so that, should it fail, your precious overclocked system will have an extra margin of safety, but at the price of (purchasing an extra fan, obviously) a small amount of extra noise. Fitting a CPU cooler requires a small blob of thermal compound, and this comes supplied with the Noctua NH-Ul4S Slim U-Series Single Tower CPU Cooler, along with all the other bits and bobs to fit it with. In this build I’m using 32GB (4*8 GB) DDR4 Memory in the form of Corsair Vengeance LPX 2666 Mhz DDR4 which comes in at a great price point. It’s Quad Channel and Intel XMP certified. So what does that mean? Vengeance LPX memory is designed for high-performance overclocking. It uses an aluminium heat spreader for faster heat dissipation and it’s low profile design fits into most microATX and MiniITX systems. Intel Extreme Memory Profile (XMP) allows you to overclock RAM including compatible DDR3 and DDR4 memory to perform beyond its standard specifications. This is designed to help enhance the gaming features built into other Intel technology. Four channel? This just means that for any given amount of memory (32 GB in this case) you can have a kit that fits that memory into 4 memory card slots (or channels) on the motherboard in order to get the fastest throughput of data. The Asus X99 Deluxe U3.1 motherboard has two sets of 4 memory-bus slots for this purpose. 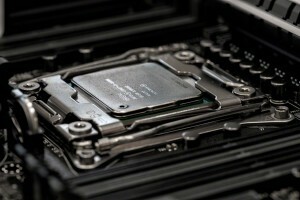 Predefined and tested Intel XMP profiles can be loaded via the BIOS, or a specific tuning application, through the computer’s operating system. Intel has developed a certification program for memory vendors to test their products for compatibility against the Intel Extreme memory Profile. Intel provide an Extreme Tuning Utility to help with the overclocking process. Asus motherboards come with the AI Suite 3 which serves the same purpose. The ASUS GTX 970 Geforce Graphics Card slots into one of the 5 PCIe 3.0 slots, then gets power from the power supply. For building a new PC the Motherboard Manual guides you on which slots to use according to whether you want to use a single or multiple graphic cards, and a special linking cable is supplied to sync the cards together if multiple cards are used. Slot 1 or slot 3 would normally be used for a single card, and slots 1 and 3 for a dual card setup. Slot 4 is added for a triple card setup. When building a new PC, this is fairly straightforward. I have a single M.2 memory module (Samsung Pro 500Gb M.2 SSD) and 3 hybrid drives(4TB Seagate Hybrid HDD) to fit. The M.2 SSD slots into the Motherboard, vertically, with a special bracket, and the 3 hybrid drives go into 3 of the 8 drive bays using the provided screws into the removable mounts. It’s best not to tighten these much as they pass through rubber grommets to provide a less rigid mount. 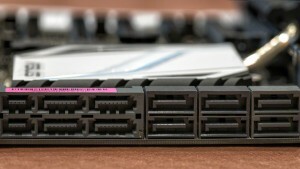 M.2 Slot with SSD Card in Place.. So why choose three 4TB spinners? I’ve been keeping my photos on two external 4TB USB drives recently, and JPEG backups of my favourite images on my Dropbox Pro Account. These drives, one for storage and the other for backup, are 60% full now, and have been quite slow with my D810 files in Lightroom. My old PC only had USB3.0 so, with the optimised USB 3.1 I was hoping for a marked increase in speed. I’m doing more and more photography with my D810, so I reasoned that it’s time to move my storage back to fast internal drives (one for storage and one for backup) for the new stuff. The third drive is for all my non-photography stuff and the backups for that are on yet more external drives. It’s not a perfect strategy, but it’s good enough for what I’m needing to do. There’s good future proofing with the ASUS board. As SATA Express drives become available I can upgrade to those without shedding the drives I’ve got fitted at the moment, and the spare M.2 slot, via the PCIe card, means that as super-fast SSD storage comes down in price and the drive capacities rise, which they are bound to do, over the next year or two, I can consider adding a further SSD without prejudicing anything else. The future expandability looks very good indeed. 3 Spinners All in a Row..
Each hybrid drive needs power and a data connection into the SATA ports. 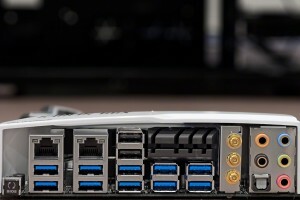 These come in at the back, and space is a little tight, so you need to use an angled SATA cable to avoid any pressure being put on the connection when the side is replaced on the case. According to Seagate, “SSHDs fuse the strength of SSD and HDD into one affordable and powerful device”. This gives you the combined reliability of both in the hybrid drive product. These drives have 4TB of hard disk storage and a very decent 8GB of fast integrated NAND Flash. Basically, the hybrid drive works out which files you are using frequently and uses the SSD to cache them without you having to do anything. As you are probably aware, SSDs have a limited write life, they hate being written to, but you can read from them as many times as you like. The main wear factor for a spinning disk (HDD) is starting them up and shutting them down, though reading and writing have small but equal wear overheads. The benefits of SSD are that they are resistant to fragmentation in the sense that it matters not where various pieces of file reside in terms of speed of access, whereas on a hard disk drive fragmentation is problematic and slows access times down dramatically. HDDs are better for storing large amounts of data, but access is much slower. So in terms of wear, caching data to the SSD cuts some wear and tear on the HDD. You can check out the detail of the technology here. This is where the rubber meets the road. Plugging in the monitor and the power supply and pressing the on button! No problem, it all worked.. Next install Windows 10, setup the wireless connection and update everything. Install the motherboard and graphics card drivers and then the hardest part of the build is installing all of the software and copying over all my data from the internal drive of the outgoing PC. Fortunately, with 8 drive bays, it was a simple matter to remove my data drive from my old PC and install it into the new one for a rapid copy and paste. Lots of my software is licensed however and needs to be deactivated from the old PC before it can be activated on the new build, but the Wi-Fi made this easier than it would have otherwise been because I could run both PCs at the same time. And herein started the real ordeal. I had several problems which involved corruption to vital windows files that were not that easy to fix, and, for stability sake, I ended up doing 2 complete installs before everything worked as it should. There is a bios update for the Asus board which will undoubtedly improve stability and I will flash the bios with the update once I’ve been running the new build for a few weeks and feel I really understand the stability issues. It’s much quieter than the old one, so much so that the hum from my powered 50w Genius Multimedia Speaker System became very noticeable and distracting. It’s been necessary to research an alternative and in the end I went with a pair of Audioengine A5+ (powered) Speakers. These play very nicely with the Crystal Sound II on the Asus X99 Deluxe U3.1. It’s said that the Audioengine D1 24-Bit DAC/Headphone Amp can improve quality still further by circumventing the built-in Crystal Sound System, so I may look into that further at some point. The Dell UP2716D Monitor is a real step up with an excellent built-in profile straight from the box. It’s sharp and clear with excellent colour and a decent fit for my desk. Much less tiring for my eyes. USB 3.1 is noticeably faster on my external WD 4TB drives, making Lightroom much more useable even on my huge back-catalogue of photographs. I’m loving the increased performance of Lightroom and Photoshop CC 2015, including my plugins, all in all it’s much more useable now. I have learned lots about the up-to-date technology in general and building a new PC in particular. Next time I might go with a transparent case and multi-coloured lighting plus a CPU water-cooler!! There have only been minor issues so far. Windows 10 didn’t want to recognize my old HP LaserJet P2200. I’m not sure what the problem was at its core, but it was resolved by switching the USB lead into a USB 2.0 port instead of a 3.0.